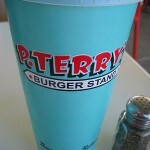 Finally made it to P. Terry’s. Now that they have the location north of the river, it’s somewhat convenient. P. Terry’s, to their credit, was one of the first (if not the first) local joints to go au naturel with the fresh hormone-free, antibiotic-free etc. beef. 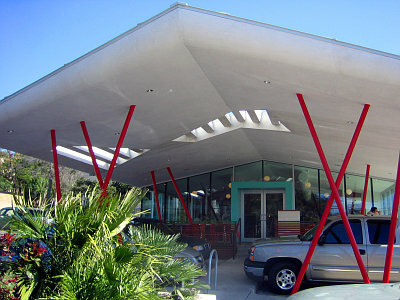 Nowadays that’s the norm it seems for new burger places (see TerraBurger, Hat Creek, Elevation). Everyone is touting their grass-fed french fries and other Earth-friendly ingreendients (I just made that up). Pros: cheap cheap cheap! Combo meal comes in under $5. Fries are GREAT. 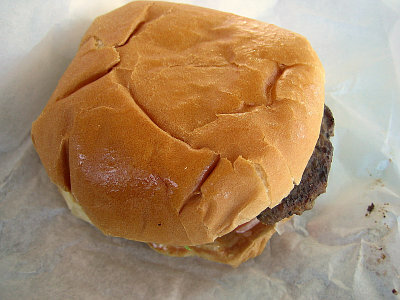 Cons: burger ho hum and dry. No cheddar. 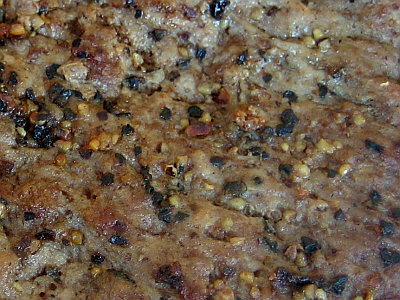 Patties look quite juicy sizzling on the griddle, but by the time they arrive at the table they somehow lose all that luster (they also seem to be impregnated with birdseed–see photo below). Mine was dry. Fairly close to the harsh description given by one poster on Chowhound–“gray, flavorless hockey pucks,” although I thought the burger did evidence some decent flavor. 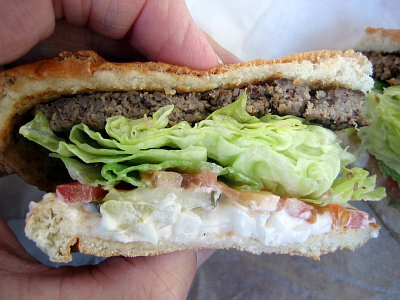 But overall it was pretty much a ho hum burger. 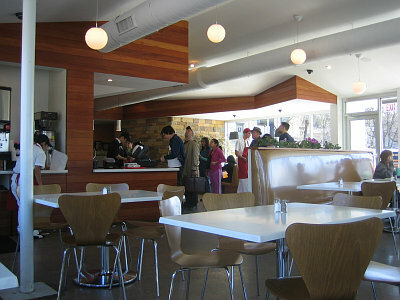 Loved the fries–fresh cut, crispy, well-cooked. Very tasty. Lastly, what’s up with their food pix online? 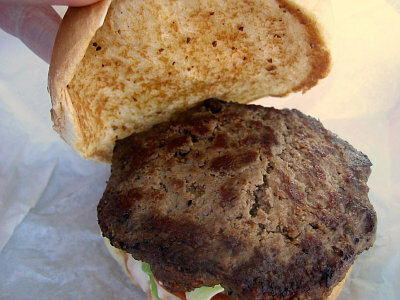 The burger photo on their website looks like they are trying to emulate the generic corporate mass-produced fast food burger look, with the airbrushed bun and the perfectly stacked components. Frankly, it looks awful. 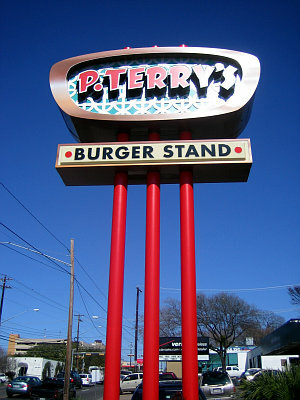 So, overall I was not impressed with the P. Terry’s burger, but would definitely stop in again for fries if in the vicinity. Uh oh, Dry Bun Syndrome. 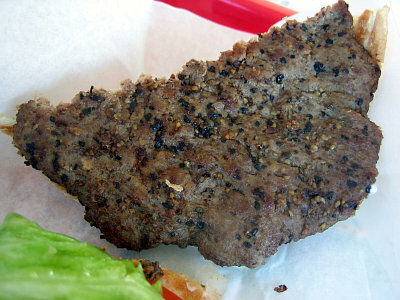 Parched patty fissure forming. Patty surface detail. Looks like birdseed. Not sure what is up here. Must be some secret seasoning (their website states that they "inspect and season each patty in our store"). I agree that they can be too dry, add some cheese and it helps. 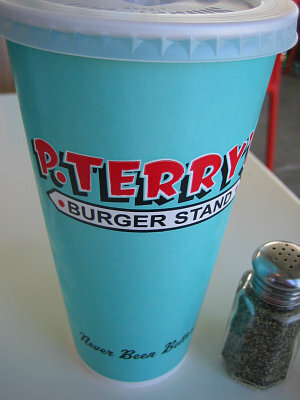 Their shakes are quite yummy with their fries as well! I think their chilcken sandwich is better than their burger. 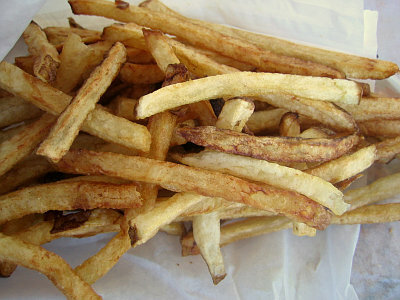 And go at a peak time to make sure you get good fries rather than matchstick overcooked ones.